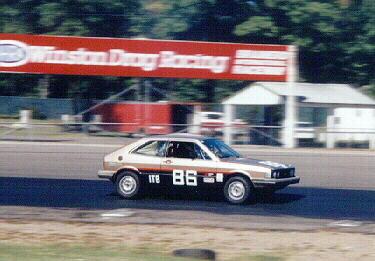 Jon debuted a "new" racer at the 1998 Jack Pine Sprints at Brainerd, a 1981 VW Scirocco (1.7 liter) in ITB. He had purchased the car earlier in the year with the intent of turning it into a racer. 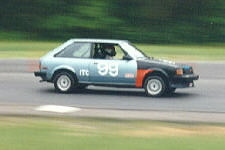 Many of the race pieces were taken from his previous ITB racer - a '83 VW Scirocco - and installed during the week prior to the annual Labor Day weekend of racing. 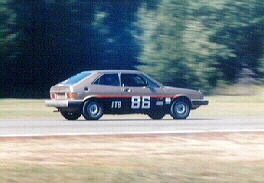 The new VW was minimally prepared for racing, rather the emphasis was on finishing a couple of events so that Anderson could renew his SCCA license. It was not fast, but did accomplish the goal of finishing two Regional races. Future plans for this Scirocco are unclear. 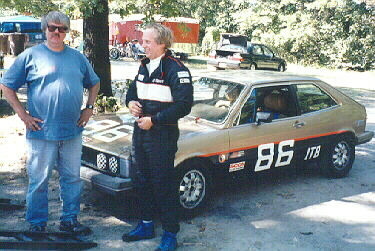 He recently acquired a black '85 Scirocco and may use that for IT, in which case the '81 could become an ice racer. Another possibility is that he may eventually add the necessary race hardware to make the switch from IT to the Production category with the '81. The Red '83 Scirocco is destined to return to street use. He raced an ITC '82 Mazda GLC Sport from 1990 through 1992, and the above mentioned '83 VW Scirocco in ITA and ITB (a change in rules) from 1993 through 1995. 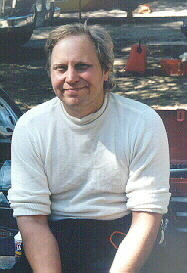 Anderson took the 1996 and 1997 seasons off as he and his wife Jill were building a new house in Hermantown, MN. They recently became parents for the first time -- Luke Alexander Anderson was born 10/27/97. For a real job, Jon works at Gopher Shoe Repair in Duluth, repairing shoes of course (no, not for gophers).